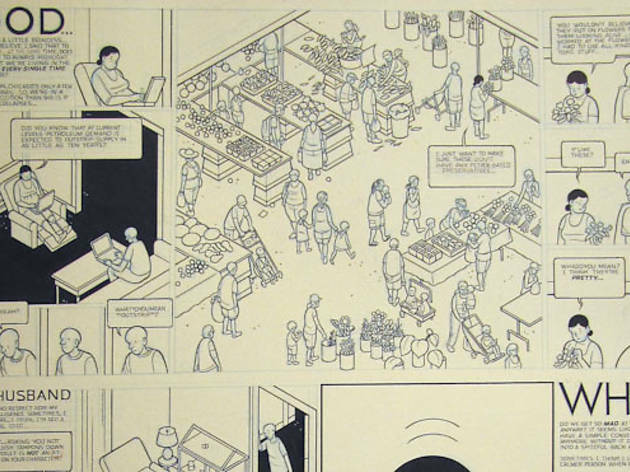 The artist unveils his new graphic novel in a gallery exhibition. 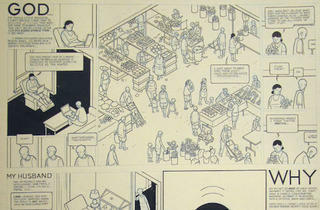 Photograph: Courtesy of Chris Ware / Carl Hammer Gallery Chris Ware, Farmers Market from Building Stories, 2011. Partially inspired by Duchamp’s Boîte-en-valise (Museum in a Box), Ware’s new graphic novel Building Stories unfolds over 14 discrete books and booklets, telling the story of three tenants in a Chicago apartment building. Drawings for the project are now on display at both the Carl Hammer Gallery and NYC’s Adam Baumgold Gallery, a concurrence Ware attributes—on a delightful exhibition poster—to his “insatiable arrogance and diagnosed graphomania.” That self-deprecating humor is one of the many qualities that have earned the Oak Park–based artist an international following. If you’re not already a fan, this show just might convert you. While it’s not easy to absorb all of his comics’ intricate detail when they’re clustered together on a wall, that’s not really the point. Rather, this is an opportunity to appreciate the building blocks of Building Stories: pen and ink drawings before color was digitally applied. Because of Ware’s inventive, sometimes labyrinthine page design—incorporating arrows, cutaways and small boxes in tight grids—his work demands time and focus: As you read it, you’re simultaneously learning how to read it. Marginal notes, in blue pencil, illustrate his meticulousness. Some are straightforward (“FIX HAIR”) while others reveal the subtleties of his storytelling. In one scene, a woman drives past her old apartment (the titular building), next to which Ware has made the marginal note “Looks like a face.” Indeed, on closer inspection, the building has a visage, staring back from across the years. Such attention to detail is the foundation of Ware’s genius; it’s also why Building Stories took more than a decade to complete.